The other day I got a hankering for pumpkin pie for breakfast. My Honey’d Pumpkin Pie is actually quite good for you, but I didn’t have the time or energy to make it while sending the two older kids off to school and getting the littles ready for home school! Instead, I decided to mix together most of the ingredients I would normally put in a pie into one bowl, then baked them all together. It turned into a delicious, healthy breakfast that took about as much time to prepare as a bowl of cereal (my bowls of cereal include a few toppings, like fruit, nuts, and chia seeds). While my Gluten Free Pumpkin Bake was in the oven I was able to continue in my morning activities, then I ate it while reading with the little boys. 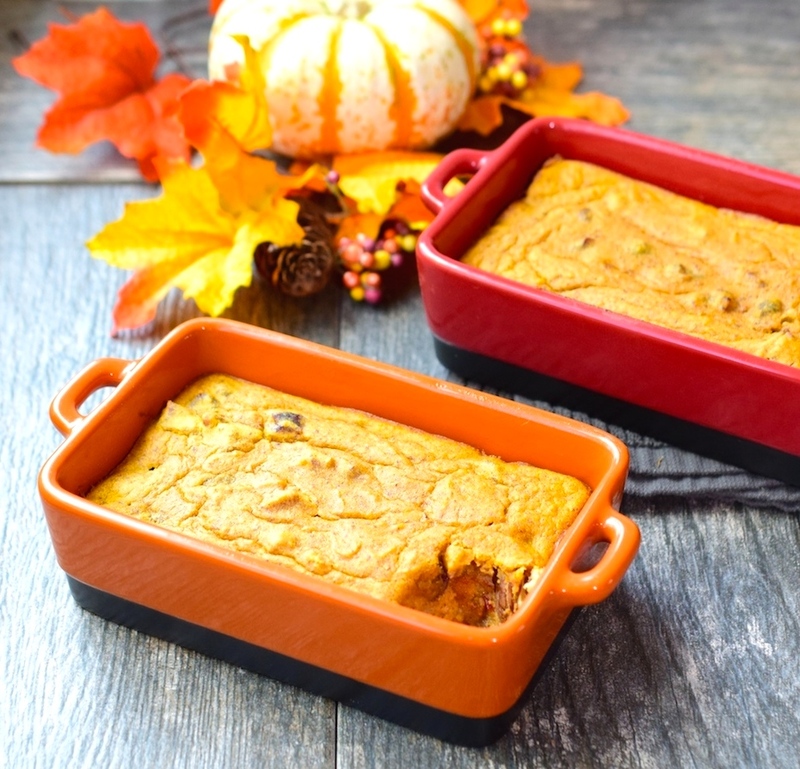 This pumpkin bake tastes a lot like pumpkin bread pudding, but it is much better for you. There is a tiny bit of refined gluten free flour in there, but it’s just enough to give it a nice texture. Try to use Pamela’s Baking & Pancake Mix , because she uses healthy ingredients, and even adds some almond flour to her mix. I use I’ve also added extra almond flour to boost the protein and fat, which lowers the glycemic index of the dish. The pumpkin and nuts are full of vitamins and minerals, and the eggs add more protein. You really can feel good about eating this dish as a breakfast, snack, or dessert. My kids were really happy when I made it as an after school snack! Every year I try to make an easy, but festive breakfast on Thanksgiving Day. Thanksgiving is already so much work, so who wants to add a complicated breakfast? There’s just something wrong with eating cereal that day, though, so I like to add some coziness by making something special. I think we’ve found our winner for this year! If you really want to jazz it up even more, add some home made apple sauce (store bought is good, too)! 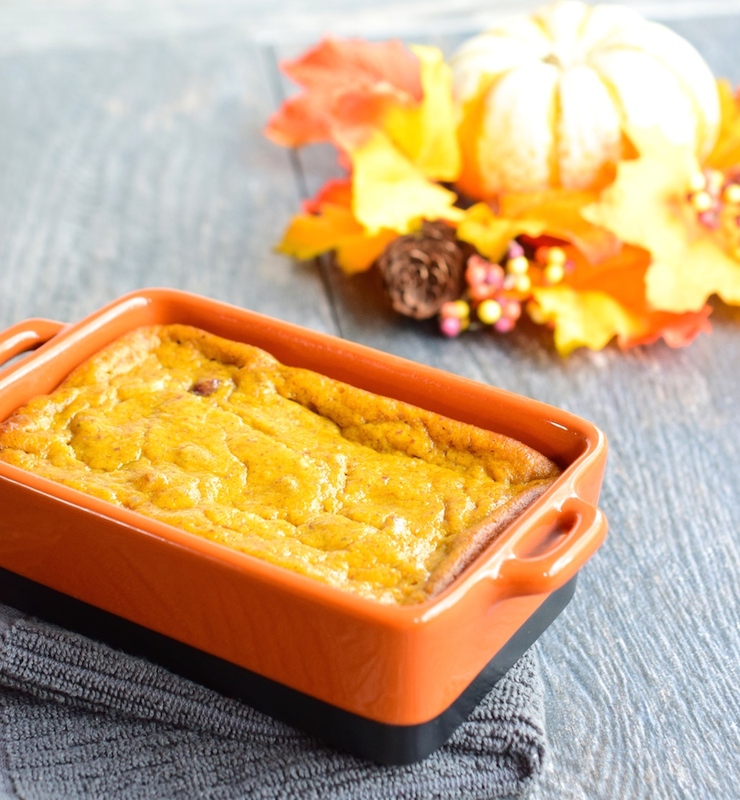 The tart flavor of the sauce compliments the mellow pumpkin flavor quite well! 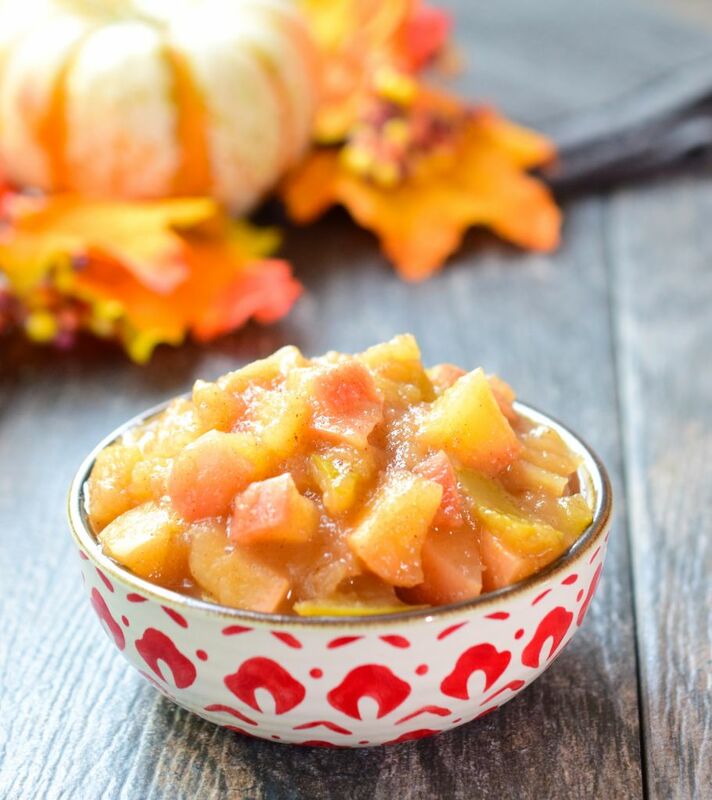 This is the apple sauce from the link I mentioned above…so yummy! Before we get to the recipe for the Gluten Free Pumpkin Bake, I want to invite you to join with others who are making healthy changes. I’d love to walk alongside you in your journey towards wholeness and health! Jesus said, “I have come that they may have life, and have it to the full!” Freedom from food addictions is part of having a truly full life. 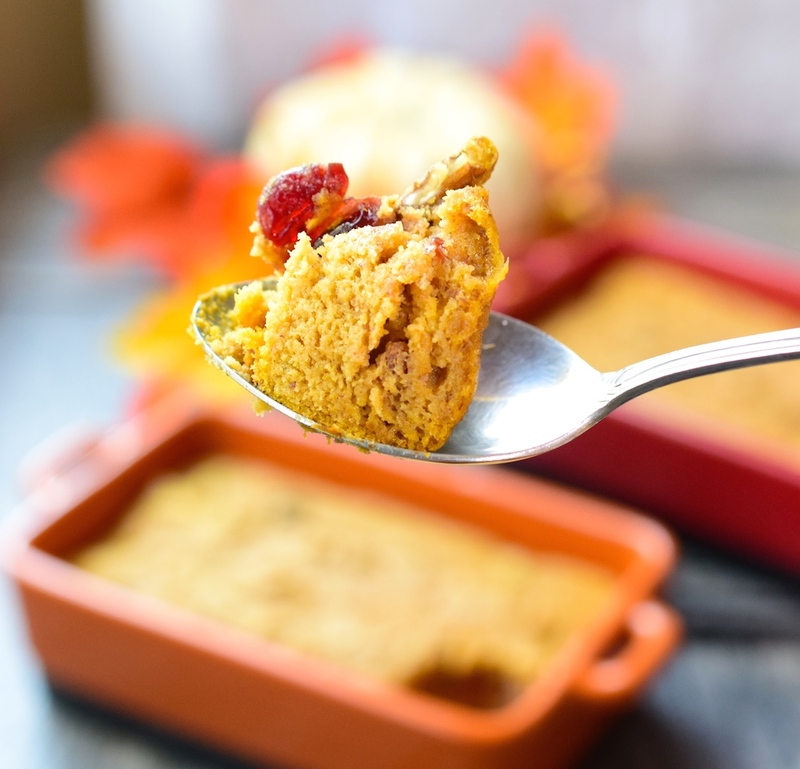 This Gluten Free Pumpkin Bake is a delicious, healthy breakfast, snack, or dessert! Made with healthy, natural ingredients, it is also dairy free. Preheat the oven to 350 degrees F and grease 2 small loaf pans. Whisk the eggs in a medium bowl, then add the remaining ingredients. Pour batter into your prepared pans. Bake for about 30 minutes, or until the centers are set. Your baking time will vary, depending on the size of your pans and your oven. Check after 25 minutes. I usually check by jiggling them with a hot pad. Enjoy warm or cold!